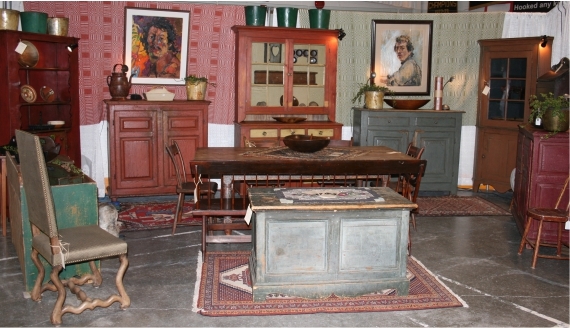 Hinton Antiques was founded in 1972 by Steve and Wendy Hinton. Steve and Wendy have long been considered among the most reputable antique dealers in the country. They specialize in pre-confederation Canadian Country furniture, Hinton Antiques sells, refinishes and restores what they consider to be pieces of Canadian history: high end Canadiana and accessories from 18th and 19th century Quebec and Ontario. Here you will find an abundance of antique pieces such as harvest tables and sets of chairs, hutches, corner cupboards, chest of drawers, blanket boxes, storage benches and more. If a lower price point is what you are after, accessories and “smalls” such as butter bowls, hand carved butter ladles, cutlery trays, baskets, wall boxes, peg racks, decoys and folk art or even sap buckets are plentiful and are great cottage hostess gift ideas. 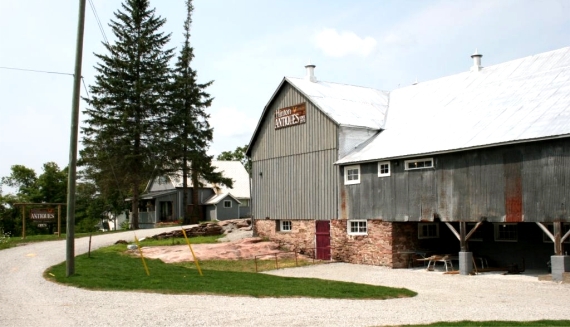 You will find Hinton Antiques in the hamlet of Washago, Ontario, just north of Orillia. More specifically — at the “T” intersection where the Rama Road (county road 44) meets County Road 169 — 800 metres from highway 11 at the Washago exit. Our showroom is now Closed for the Winter season but will be more than happy to meet you if you contact us to book an appointment. Please see our hours for details.